A motorcyclist who was seriously hurt when he was in collision with a car on the Isle of Man has been transferred to a Merseyside hospital for treatment. Police said the 28-year-old man from St John's was travelling in the same direction as a blue Mercedes driven by a 59-year-old woman when they crashed. 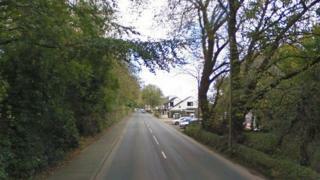 The incident happened outside the Hawthorn public house on Main Road, Greeba at about 18:45 GMT on Saturday. The motorcyclist is receiving treatment at Aintree hospital in Sefton. Anyone who witnessed the incident has been asked to contact Manx police headquarters in Douglas. Det Sgt Alan Shimmin thanked members of public who assisted police and ambulance officers at the scene.